She was eating the soup for the first time, so I didn’t worry if she didn’t seem to like it. I knew that one day, when feeling ready, she’d come back to it. And enjoy the flavors of the soup that rhyme so magically well with summer. Suffice to look at all this eye-catching red! 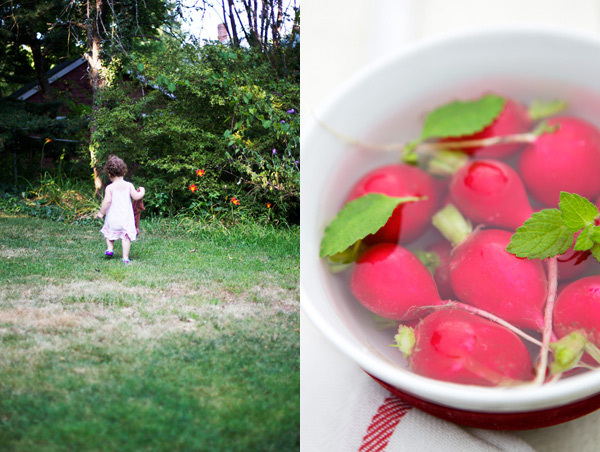 She pointed at the bowl of radishes on the table instead. “Tu préfères un radis ?” (Do you prefer a radish?) I asked, holding a pink radish to her. She took it from my hand without hesitation, murmuring a Thank you in her own words, and then she bit into the radish. Happy now, it was obvious. I grabbed one too and we both sat at the dining room table by the back garden, busy eating our radishes with contentment, appreciating the crunchiness and peppery taste that the food released on our tongues. Lightly seared salmon and a pot of warm brown rice cooked with marjoram, cumin, cream, peas and watercress were following–foods she never says no to either. Just like the fresh raspberry and custard tart I had baked in the morning. As to P. and I, we were thankful for the pot of gazpacho I had prepared. A large pot with colorful toppings to give more body to the soup. “Miam, c’est super bon,” P. said after a taste. (Yum, it’s delicious!) I had found beautiful organic tomatoes that had the name gazpacho written all over them. So gazpacho there was. Plenty of it, in fact, in the week that followed. The first time I prepared the soup, I used leftovers of brioche previously soaked in water. The next time–this recipe–I decided to skip the brioche, and served the soup with toppings that included fresh corn and diced avocado. We had enough for two days, which is always a bonus with a food like gazpacho as flavors will have had the time to develop. I am still not sure which recipe I preferred. They were different but similar at the same time–I am sure you have your own variant too, non? Both were a refreshing way to start our meal. Ideal for the warm temperatures of the day. Summer. Of course, the best tomatoes make the best gazpacho. Which means that gazpacho is really at ist best when prepared during summer. En été. I remember that when I was still living with my parents, my mother never bought out of season produce. I remember that she always made a point about it even more at times when I’d beg for strawberries during winter. In the French countryside where I grew up, it was hard to find them anyway. So we ate seasonal food. In summer, vegetables that grew in the garden, like peas, salad, haricots verts, carrots, beets, zucchini, radish. They simply stand out, don’t they? Make a large pot and serve it as an appetizer or a main course for a light meal. Or serve the soup in shot glasses, as an amuse-bouche to start a meal. I’ve done this many times, and it’s always something our friends enjoy. To make the soup, blanch the tomatoes in boiling water for 1 minute. Rinse them under cold water to cool them and stop the cooking process. Peel, core, seed and dice them. In the bowl of your food processor, combine the tomatoes, pepper, 3/4 of the cucumber, onion, garlic, tarragon and a dash of chili flakes. Blend until very smooth in texture. Stir in the sherry vinegar, olive oil, season with salt and pepper and transfer to a container. Cover and refrigerate for 3 hours, or overnight so that the flavors develop even more. Serve the soup in bowls and top with a mixture of hard boiled egg, chopped tomato, cucumber, avocado, shallot and corn. Add a drizzle of of olive oil and season with more salt or pepper and oil if necessary. It’s amazing how well children will eat if they’re exposed to good food at a young age. Bravo to you for taking the time to prepare and share the gift of real food. (I say this as a childhood victim of Sunbeam bread, Kraft cheese and Devil Dogs) She’ll be so much better off later in life to have developed good, healthy eating habits. And the soup-it looks phenomenal. I am dizzy with so many gazpacho recipes blogging around. I do not have a recipe to call my own. I guess I will have to hunker down this weekend and gazpach’. I do like the shot glass idea very much. What a joyful way to start a nice long meal. Happy summer to you and your family. Have been immersed in gazpacho too! Just posted about it, also. It’s hard not to think about refreshing, summer vegetables in July. Almost criminal not to. Cheers! This is the first time I’ve seen a gazpacho recipe with so many wonderful toppings! 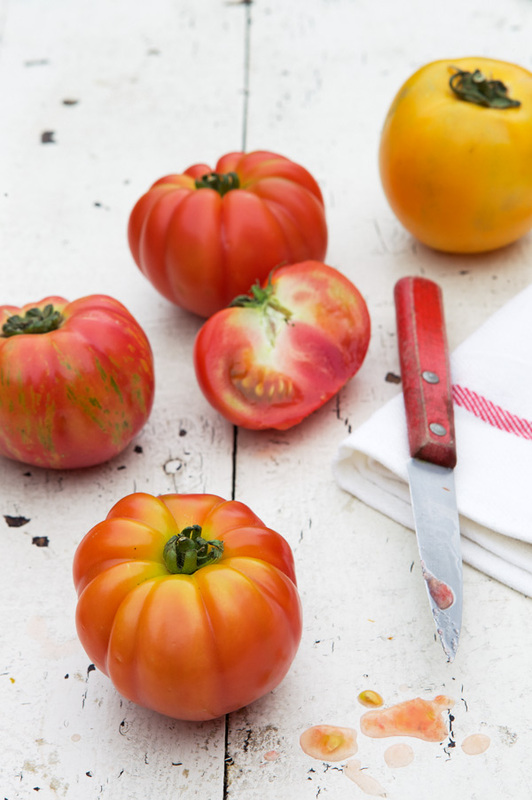 It’s wonderful that there has been a re-emergence of so many interesting, unique and flavorful heirloom varieties at farmer’s markets in the past decade. This looks like a great recipe. bein la…. il y a tout qui me plait 🙂 les photos, la recette, l’histoire bref tout !! belle journee ! love the vibrant color in the dishes and food! I adore gazpacho. 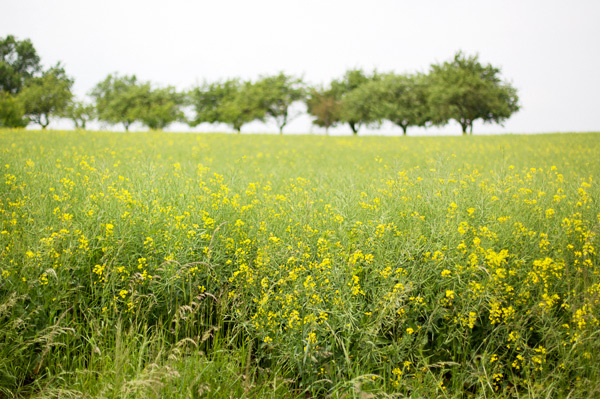 Yours looks splendid and so do you atmospheric summer pictures! the second pic on this post is probably one of my fav photographs you’ve ever taken. very much the essence of summer colors! p.s. that cake stand is the cutest thing ever!!! 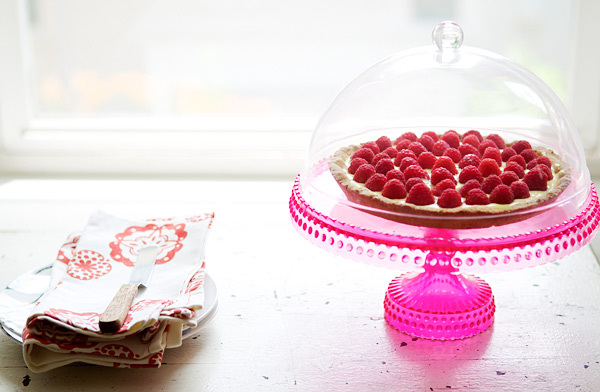 Beautiful raspberry tart and tart stand! Where did you get the stand? What is the name of your china pattern? And what are the cups called? They’re beautiful! I recognize the bowls with the thin green border and red china pattern, they come from Anthropologie, I love that store! The colors are amazing…Now if I could get my 3 year old daughter to try a vegetable other than corn!! 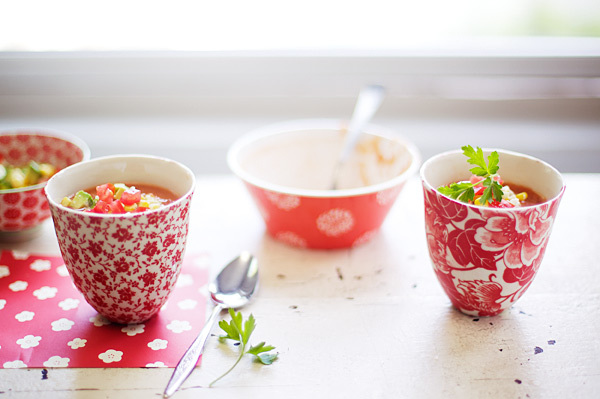 🙂 I’m curious to know where you purchased the stunning red soup cups and bowls. Are you willing to share?? I hope so!! Have a lovely weekend. 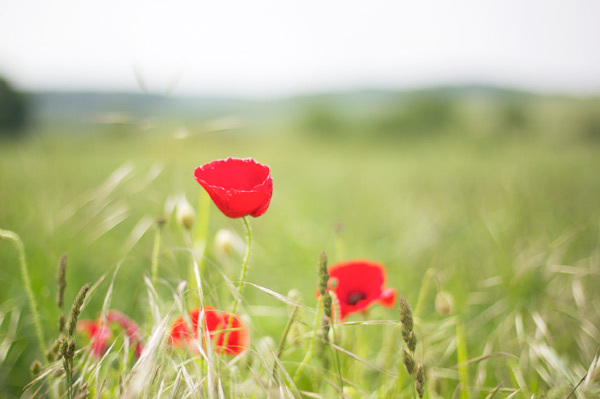 Beautiful red post. Red, for me, is summer, non? Love Lulu’s palate, she prefers radishes to tomatoes. It’s great! Your blog is beautiful…I will definitely be back! Absolutely gorgeous! Gazpacho sounds perfect right now. Mmmm, and those tomatoes look divine! so excited to try this! have been searching your blog for gazpacho because i am confident that yours will be the best!! Both versions of the soup look fantastic. Wonderful colors, and so exactly what I crave on a hot night. 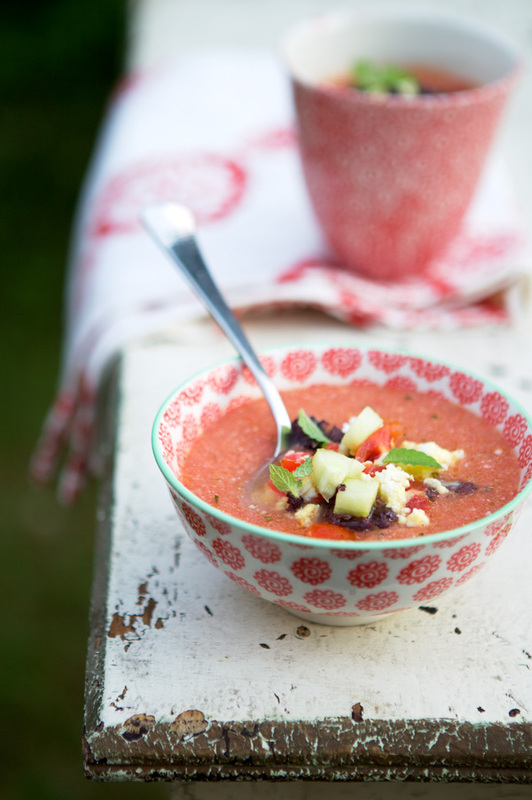 My husband is a gazpacho-addict so I MUST try this recipe…. I love the bowls !!! and your little daughter..makes me nostalgic! mine have grown!!! These pictures blew me away. I love the pink-coral-orange-red color of the bowls. Those bowls are SOO adorable! Rose D – corn is not a vegetable, it’s a grain! OHhh my! such vibrant colors! I love the way you captured the food and the photographs…i love it so dearly! And ive been searching for a very good gazpacho recipe and am definitely going to try this for sure! I’m curious about your brown rice cooked with marjoram, cumin, cream, peas and watercress. When do you add the cream? Do you use it in place of water or add it at the end? Is the marjoram fresh or dried? Thanks! 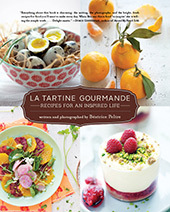 Have been an avid reader and maker of your recipes for years! What a great recipe you have. I especially like the fresh herbs for the garni. Gazpacho is one of my all time faves. During Lent we eat it and will add shrimp or cooked fish right in. Some fresh bread and a little wine. Les Bon Temps Rouler. Thanks for a wonderful rendition. C’est magnifique! Un vrai moment d’été! It’s strange…I’ve never tried gazpacho in my whole life. Looking at these pics make me think otherwise – i have to try it! Beautiful gazpacho, well photographed and it looks delicious. Good for you for introducing all these wonderful flavors to your child at a young age. I did as well, and to this day they have a passion for food. Ohh Ohh recipe for the raspberry custard tart?! Looks delicious!!! Cups are from Anthropologie and cake stand was purchased in France. That gazpacho looks amazing. What beautiful pictures! I always love your posts. et ce plat à gâteau est superbe! Stunning photos, Bea. 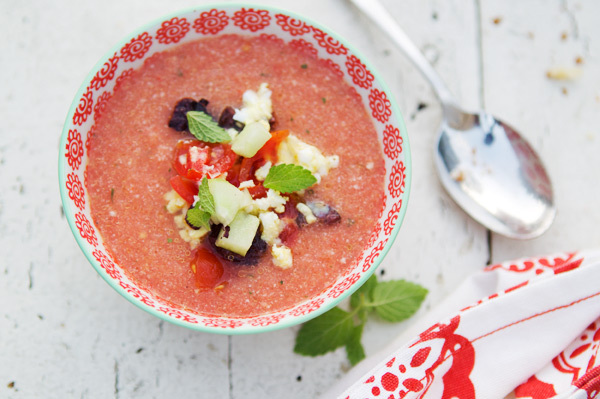 Gazpacho is one of my favorite soups and just screams summer. You’ve successfully made me very hungry :). Je me régale rien que de lire cet article ! You got me with the Gazpacho, then I saw the tart and my attentions turned to dessert, soup later. Lovely, thank you. 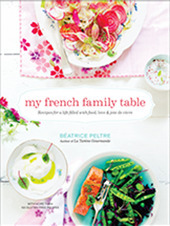 Your recipes are always fabulous, and your food styling/photography is gorgeous… but those little red bowls are divine. LOVE. I made your gazpacho for my family today, and we all loved it very much. Thank you! I will definitely make this particular soup again rather sooner than later. So gazpacho there was. Plenty of it, in fact, in the week that followed. I looked at the pic & thought it could be strawberry & sweet. Maybe Lu thought that and was surprised. She is adorable. Mmmm. 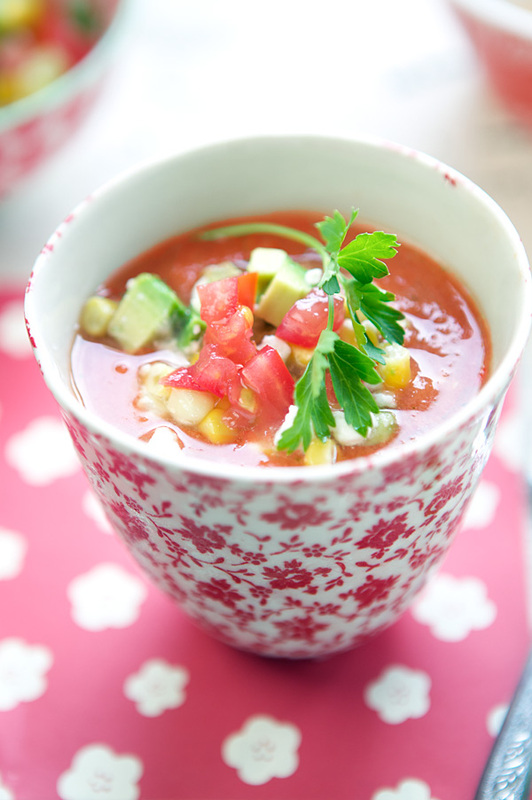 Lovely gazpacho recipe, and the topping is wonderful. I eat lots of gazpacho through summer, usually just basic ingredients whizzed together in the blender, but this recipe has inspired me to put in a little more effort. It is certainy worth it. (and eating such a healthy meals means that now and again I can indulge in the most delicious ever chocolate cake recipe I found on your site). Thank you for sharing. Lovely. Not sure when you posted this. In fact, it’s possible that if was a long time ago, I’ve already responded! Mad about gazpacho! Sharing your site with a Japanese student of mine doing research on bamboo shoots! Yes, gazpacho is my daily meal in the summer, esp. since Amp is away at camp, so no need to be elaborate! It’s always good, however you mix it up. An infinite number of gazpacho recipes. My standard go to toppings are HB egg, [bien sur], avocado and pickled shrimp. Saw P the other day! Happy summer to all of you. 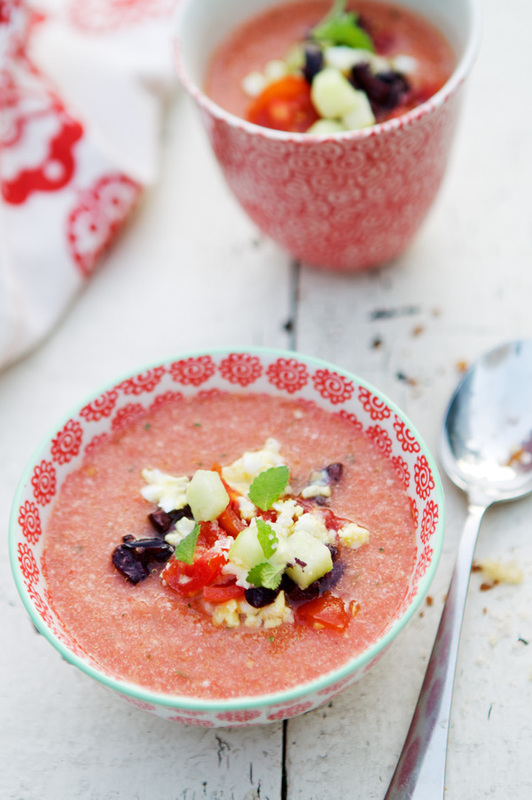 Pingback: Low FODMAP Gazpacho | Can I Eat That?